For four decades, President’s Council members have been at the forefront of giving to help heal, enhance and save lives. Enjoy the rewards of membership in this remarkable philanthropic group. With an unrestricted gift of $1,000 or more you could become a member of Presidents Council or Mercy 1000. And you can read our digital newsletter Insights Online for the latest updates on President's Council. By joining President's Council, you will get to enjoy all the benefits of membership. Please see the chart to the right for more details. Beginning January 1, 2016, membership in Scripps 1000 and Mercy 1000 will be reserved for those who make unrestricted gifts only, which are applied where the need is greatest. Individuals, whose donations were made between October 1 and December 31, 2015, will be grandfathered. Learn more about the power of unrestricted gifts. Members can attend a variety of exclusive events and meet physicians, executive leadership and others. For more details on upcoming events, please contact Annual Giving at 858-678-7061 or presidentscouncil@scrippshealth.org. 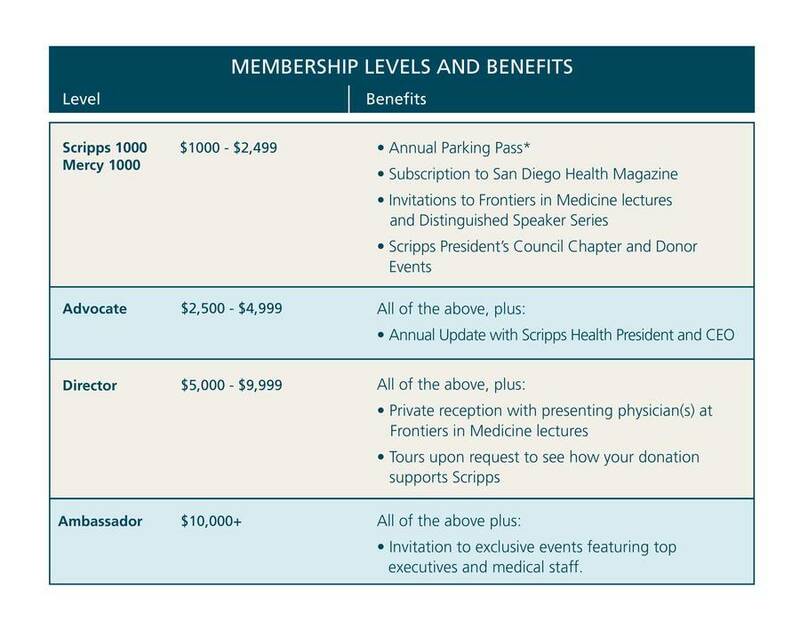 One of the benefits associated with President’s Council membership is complimentary self-parking at all Scripps hospital parking structures and designated lots. We are moving to an automated parking system at all of our sites. Additionally, parking cards are no longer issued every year. Instead your card will be re-activated each year upon receipt of your President’s Council membership renewal. Presidents Council is an extraordinary group of compassionate supporters who help us ensure quality patient support services at Scripps. In return, it rewards members with access to our physicians and researchers, insights into medical breakthroughs, and more.